Not all the participants in the Valley Forge Revolutionary 5-Mile Run® on April 19 are adult runners. To be as encompassing as possible, the event also comprises a youth-oriented fun-run and a three mile walk. The walk is open to all - including parents with strollers and pet-lovers with leashed dogs. To sign up, visit the Rev Run registration page, here. As a way of highlighting this healthful, enjoyable means of exercise, which also benefits Valley Forge National Historical Park, The Pursuit has engaged a guest blogger to describe the experience. My name is Parker. 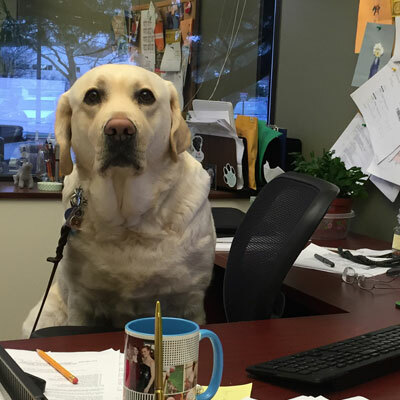 I am a Yellow Labrador Retriever, and I am almost four years old. I live in Limerick, Montgomery County, and I enjoy the trails all across the area, including Valley Forge. My daddy brought me to the park to test out the walkers&apos; course for something called the Revolutionary Run. I don&apos;t really understand that name, but I think it has something to do with the fact that I get "revved up" before going out. Although that&apos;s kinda frowned on at this event, dad tells me. Dad says that walkers who bring dogs to the event get special parking. So do people with strollers, which he tells me are little wheeled carts for puppy-sized little humans who can&apos;t walk yet. Everyone else has to take something called a shuttle bus. I thought at first he said a sheltie bus, which sounded like a lot of fun, but I realized I was wrong. So here&apos;s my first bit of advice: If you and your human are going on the walk, make sure your human gets a special pass to bring their cars into the park. The walk starts near some little houses made of logs that smell really, really good. I don&apos;t know who lived here, but I did duck inside one of them. It had shelves on both sides, but sadly, none of them were like the shelves in the kitchen at home, where dog food and dog treats are stored. Once we exited the little house, we were back on the path. It is wide and paved, so the walking is easy for dogs. And for little humans pushed around on their wheeled carts. I like the little humans. They smell like milky cereal and sugar. Most of the time. We start down the path. I see a wide field that I would love to romp through, but the rules on this walk are clear: No dogs off leash. It really doesn&apos;t matter, though. I can sniff everything I want to, even with my leash on. Also, dad told me people should probably avoid those flexy, stretchy leashes that do nothing but trip people. We walk on, and I meet two humans - one grown up and one small, but the small one is not in a wheelie cart; she is walking, too. With them is a young puppy named Nacho. Nacho is an eight-week-old shepherd, and I think I scared him accidentally, even though I didn&apos;t mean to. All I wanted to do was play! But that brings up a good point about walking this walk. It requires that dogs act nice. Dogs shouldn&apos;t mess with other dogs they don&apos;t know. And even if doggie friends go together, they should be on what dad calls best behavior: no jumping, barking, nipping or goofing around. That&apos;s tough for a Labrador Retriever, but if I can do it, your dog can, too. Speaking of messes: Make sure your human brings one of those little bags with him or her. My dad always has a supply in his coat pocket, which is a good place to store them when they&apos;re empty but not such a good place when they&apos;re full. Oh, also while I&apos;m thinking of it: No marking the stones or wooden houses or anything else that is not a tree. Dad says that&apos;s a no-no. We then pass through something that looks like a giant doggie door, but with no flap on it. It is made of stone and has some funny faces on it - and also some letters that humans can read but I can&apos;t. It is super-tall; taller than dad. Taller than a Great Dane, even. The ground here is paved with little square rocks, and I think they&apos;re fun to walk on. But little humans in their wheeled carts will probably find it a little jiggly. That would be fun, I&apos;m guessing. We come down a short hill and head up another one. 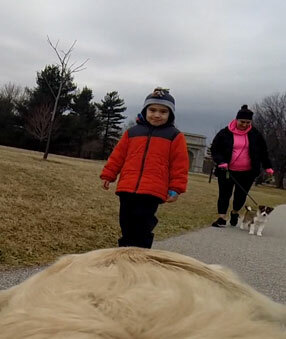 This walk has some ups-and-downs that leave dad huffing and puffing, even though we weren&apos;t running. There are things along the way that the humans are interested in, but I couldn&apos;t care less about. And then there are things that I find fascinating that, for some reason, my dad finds boring. 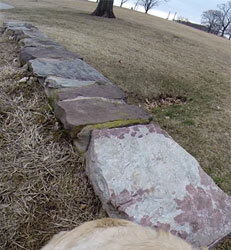 For instance, I found a small stone wall with some water gurgling near it. I sniffed and sniffed and sniffed some more, getting a whole bunch of information about other dogs that had been there. And bunnies and squirrels. And deer, which had drank from the water. And the next thing I know, dad is telling me to heel, which I know means "Hurry up and walk right here beside me." Again, if you know some of the basic commands, they will come in handy during this walk, mostly because you&apos;re sharing the path with a bunch of other people and dogs and stuff. 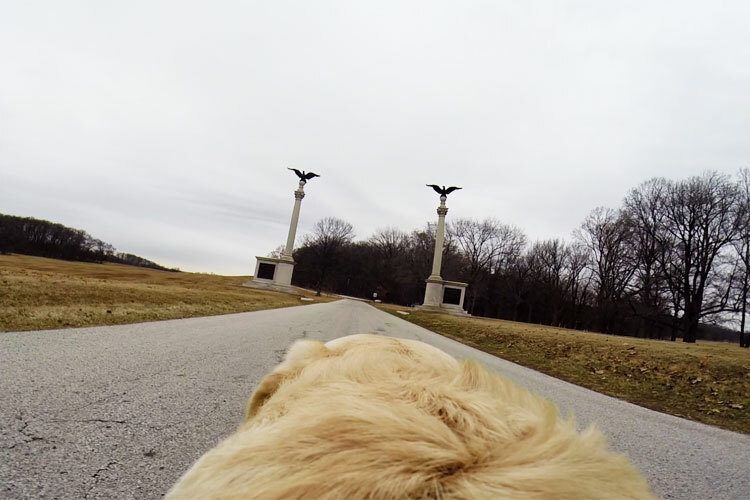 We then walk toward to giant stone sticks in the ground, and way on top of them are a pair of big birds. I don&apos;t understand why these birds don&apos;t fly away - especially with a dog coming right at them - but they do not. Maybe it&apos;s because they&apos;re so high up. We pass them and then turn around and head back the way we came. Dad tells me we have gone a mile-and-a-half, which means nothing to me, and that we are halfway finished the course. I am panting at this point, and we stop for a few schlurps of water. It&apos;s not a bad idea for your human to bring a water bottle or something. By this time, we were both thirsty. About a half hour later, we were back where we started from. It was a really fun walk, but now, I&apos;m looking forward to a nap. I hope this inspires all the dogs in Montgomery County to bring their humans to the walk. Parker the Lab is almost four years old and lives with his family in Limerick, Montgomery County. He has extensive knowledge of the area, visiting the local trails, fields, parks and waterways on a regular basis. He is a certified therapy dog, participating monthly in a reading program at Pottstown Library. He also holds several designations for obedience with the American Kennel Club, but his true talent lies in his multi-decibel snoring.